Series features music by Wynton Marsalis and the voice talents of Tom Hanks, Jeremy Irons, Paul Giamatti, Oliver Platt, John Lithgow, Samuel L. Jackson, Patricia Clarkson, Adam Arkin, Sam Waterston, Josh Lucas and others. The narrator is Peter Coyote. Arlington, VA (May 10, 2011) – PBS announced today that PROHIBITION, a new three-part, six-hour documentary series by Ken Burns and Lynn Novick, will air October 2, 3 and 4, 2011, 8:00-10:00 p.m. ET on PBS. Set in the era of bathtub gin, bootleggers and speakeasies, the series tells the true story of the rise, rule and fall of the 18th Amendment to the U.S. Constitution. It was called the Noble Experiment, but it was in fact one of America’s most notorious civic failures, an object lesson in the challenge of legislating human behavior. PROHIBITION begins with the story of America’s growing concern about alcohol abuse in the 19th century. Saloons and taverns flourished with the growing availability of hard liquor, and with them, a culture of men that neglected and abused their wives and children in favor of liquor. Families were being destroyed, and many feared that the American social fabric would disintegrate. Women such as Elizabeth Cady Stanton, Frances Willard and Carry Nation first demanded temperance, then outright Prohibition. The hugely powerful Anti-Saloon League took up the mantle in the late 19th century, setting its sights on a Constitutional Amendment banning the sale and manufacture of alcohol. The 18th Amendment was ratified on January 16, 1919, and went into effect one year later. For the next 13 years, America would be split by a fierce cultural divide between “wets” and “drys” as Prohibition pit the city against the countryside, Protestants against Catholics, immigrants against native-born citizens. Prohibition turned law-abiding citizens into criminals, made a mockery of the justice system, caused illicit drinking to seem glamorous and fun, encouraged neighborhood gangs to become national crime syndicates, permitted government officials to bend and sometimes even break the law, and fostered cynicism and hypocrisy that corroded the social contract all across the country. The film raises vital questions that are as relevant today as they were 100 years ago – about means and ends, individual rights and responsibilities, and the proper role of government. In conjunction with the broadcast, PBS and Florentine Films have partnered with the National Constitution Center on a joint initiative to foster a national conversation about “Civility and Democracy.” As part of the project, NCC and PBS will work together to develop educational materials and Web content connected to the series. In addition, Burns, Novick and their team at Florentine Films will work with WETA, the Washington, DC based public television station that is Burns’s producing partner, to create station and pubic engagement tools around the theme of “Civility and Democracy,” and lead conversations about the issue in a multi-city tour that will take place this spring, summer and fall. 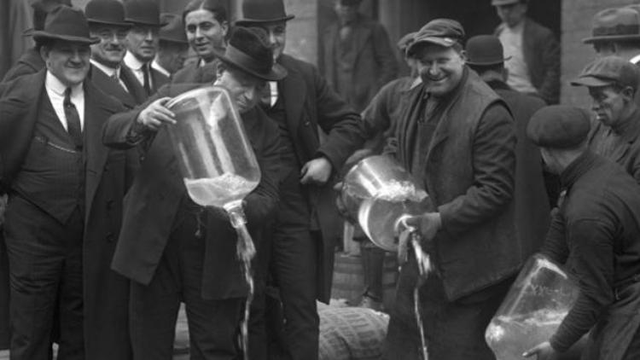 A preview website for PROHIBITION is available at pbs.org/prohibition and includes video clips, opportunities for users to share stories, background information on the film and filmmakers, and information on engagement activities. The full PROHIBITION companion site will launch in September 2011 and will include selections from scripts, video outtakes and transcripts from interviews, archival footage and photographs and music, as well as educational outreach materials and lesson plans which will enable teachers to use Prohibition as a historical lens to explore the role of dissent and protest in America and the role of civic engagement in society. Full episodes will stream on the site for seven days after broadcast and clips from the film will be available on PBS’ free apps for iPad and iPhone. WETA and PBS have also launched a social media campaign designed to engage audiences online in conversations and discussions around the themes in the film. Fans can follow Ken Burns on Twitter @KenBurnsPBS or on Facebook at Facebook.com/KenBurnsPBS. PROHIBITION will be available on DVD and Blu-ray from PBS Home Video: ShopPBS.org; 800-PLAY-PBS, 24 hours a day, 7 days a week. Corporate funding for PROHIBITION is provided by Bank of America. Additional funding is provided by Corporation for Public Broadcasting; National Endowment for the Humanities; The Arthur Vining Davis Foundations; Park Foundation, Inc.; The Montrone Family through The Penates Foundation; Public Television Viewers and PBS. PROHIBITION is a production of Florentine Films and WETA Washington, DC. Directors: Ken Burns and Lynn Novick. Writer: Geoffrey C. Ward. Producers: Sarah Botstein, Lynn Novick and Ken Burns. Editors: Tricia Reidy, Erik Ewers and Ryan Gifford. Cinematography: Buddy Squires. Narrator: Peter Coyote. WETA Washington, DC, is the third-largest producing station for public television and the flagship public broadcaster in the nation’s capital. WETA productions and co-productions include THE NEWSHOUR WITH JIM LEHRER, WASHINGTON WEEK WITH GWEN IFILL AND NATIONAL JOURNAL, AMERICA AT A CROSSROADS and IN PERFORMANCE AT THE WHITE HOUSE. Additionally, for more than 20 years, WETA has partnered with filmmaker Ken Burns to bring his landmark documentaries to the nation via public television, including the 2007 film THE WAR. Sharon Percy Rockefeller is president and CEO of WETA. More information on WETA and its programs and services is available at www.weta.org. PBS, with its nearly 360 member stations, offers all Americans — from every walk of life — the opportunity to explore new ideas and new worlds through television and online content. Each month, PBS reaches 124 million people through television and 20 million people online, inviting them to experience the worlds of science, history, nature and public affairs; to hear diverse viewpoints; and to take front-row seats to world-class drama and performances. PBS’ broad array of programs has been consistently honored by the industry’s most coveted award competitions. Teachers of children from pre-K through 12th grade turn to PBS for digital content and services that help bring classroom lessons to life. PBS’ premier children’s TV programming and its website, pbskids.org, are parents’ and teachers’ most trusted partners in inspiring and nurturing curiosity and love of learning in children. More information about PBS is available at pbs.org, one of the leading dot-org websites on the Internet, or by following PBS on Twitter, Facebook or through our apps for mobile devices. Specific program information and updates for press are available at pbs.org/pressroom or by following PBS Pressroom on Twitter.